It’s a well-established fact that Japan gets everything cool before we do. 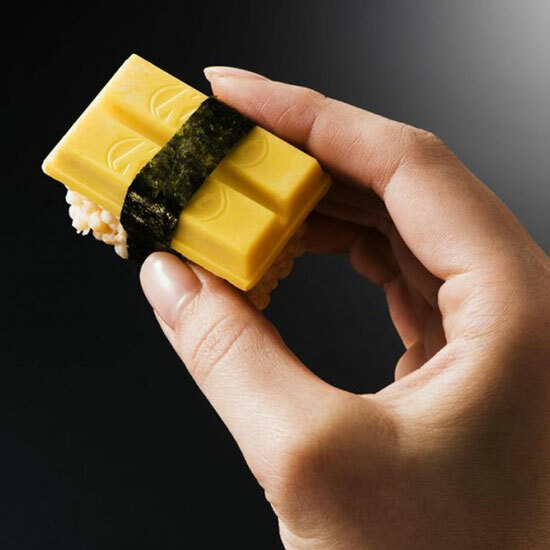 Add to that list this deliciously adorable serving of sushi featuring the Kit Kats. Using a variety of regionally available flavors—raspberry, Hokkaido melon and pumpkin pudding—the wafer-filled candy bars stand in for tuna, egg and sea urchin in these decidedly unsavory (that is to say, sweet) treats. The "rice" is puffed rice covered in white chocolage and the "seaweed" is, well, seaweed. You can only substitute candy in so many places. The Kit Kat sushi will be served as a promotion for the opening of Tokyo’s newest all Kit Kat store in the Ginza district. There is already one location of the specialty shop in Ikebukuro that opened 2014, as well as seven more outposts in shopping centers and departments stores. It’s safe to say Japan is enamored with Kit Kat bars, and we don’t blame them. With dozens of flavors like cookie dough, red velvet and cherry blossom, as well as epic hacks like baking Kit Kats, there’s a lot to love.